Recently, I discovered Haflinger cat slippers! I had another pair of Haflinger slippers for years that I loved but had worn out (and didn't have cats on them). Much to my delight, a search for Haflinger slippers on Amazon revealed their line of cat slippers! They are the best cat slippers I have ever worn. Since I knew my size for Haflinger slippers from my previous pair, which I had purchased at a store, ordering them on Amazon was quick and easy. I chose the gray slippers with the white cat. There are several other options available in different colors and cat styles which you can see in the table below. Click the button to see them on Amazon. Note: All links to Amazon are affiliate links, which means I will earn a commision if you make a purchase. What makes the Haflinger cat slippers the best cat slippers? The slippers are made of wool, which makes them feel cozy. They are not itchy or too hot. The bottom of the slippers have anti-slip rubber nodes, but I can't feel them while walking. I dislike any socks or slippers where I can feel the anti-slip digging into my feet when walking. These slippers are cute. My favorite is the gray slipper with the white cat. Haflinger offers a few other color combinations and cat styles. The quality of the product is excellent. Scrolling through the cat slippers on Amazon, most of the slippers look like they will not last long or that I would quickly feel the hard floor. I don't like thin or flimsy soles! They don't look cheap! They cost more than foam slippers, which makes me feel they will last longer and are a better product. Anti-Slip nodes on the bottom of the slipper. You can also see that the bottom is felt, not solid rubber or plastic. Can you wear these cat slippers outside? The sole of the slippers appears to be compacted fabric. I would not recommend wearing them outside. Maybe walking to the mailbox would be okay, if the ground was not wet. My previous Haflinger slippers had a solid sole which was rubber or some kind of hard plastic. I didn't see these option available for cat slippers. I consider these cat slippers to be house slippers. Also, pieces of kitty litter may get stuck in the fabric, if you wear them around your kitty litter boxes. I am okay with this, but if you are not, you'll probably want to find a cat slipper with a solid sole which is easier to clean. Haflinger has care instructions on their website, which you can read here. Haflinger cat slippers are durable, high-quality slippers. These slippers are cozy because of the wool. The fabric bottom may make cleaning a hassle, and you'll probably not want to wear them outside. They are perfect for wearing in the house and are the best cat slippers I've come across! These slippers are not for you if you don't like the design of the cat split across the slippers (head one slipper and tail on the other). 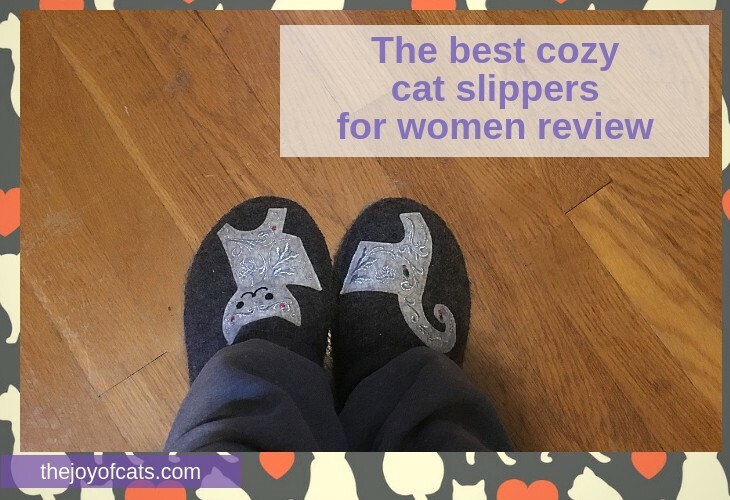 Do you have a favorite cat slipper?